Wordtrainer needs any of the above operatingsystems to work. 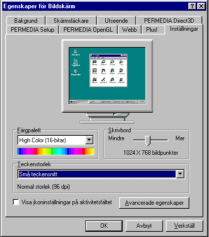 The programmet has been tested with Windows 95, Windows ME and Windows XP but should also work with other versions. About 2 MB of free disk space. In order for the program to work the font size setting in Windows must be the default size (96dpi) or "Smal fonts". Open the Controlpanel - (Click on This computer on the Desktop and than on Controlpanel). Click on the tab Settings. Select "Smal fonts" in the list Font size. If you been asked to reboot the computer, exit all programs and press Yes.